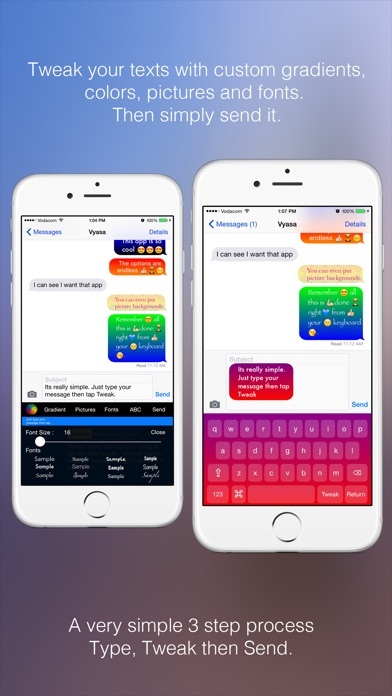 Text Tweaker Keyboard allows you to tweak your messages right from your keyboards. You can • Change the background color • Insert a gradient • Use a picture as a background • Change the font color • Change the font size • Change the font • and much more. 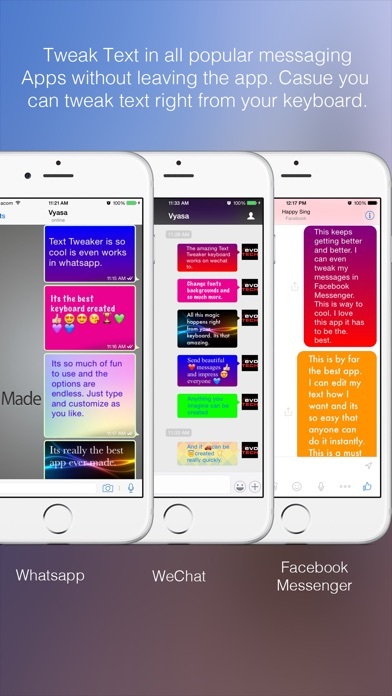 Customise your message bubble to anything you want. You can do everything right from your keyboard in any app. Its really simple. Text Tweaker has many other features such as swipe gestures that you can define. For example you can swipe to the left to delete a word etc. You can also type and translate text to and from over languages. 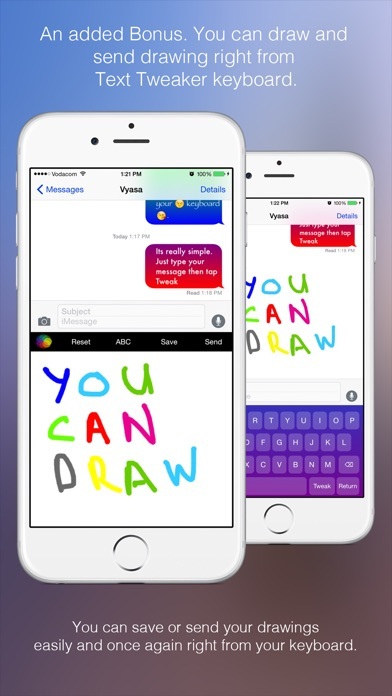 You can draw on the keyboard and send those drawings. There are smart keys, gestures, translations, Tweaking etc. There are many features to enjoy. This is horrible!!!! DO NOT BUY!!!!!! 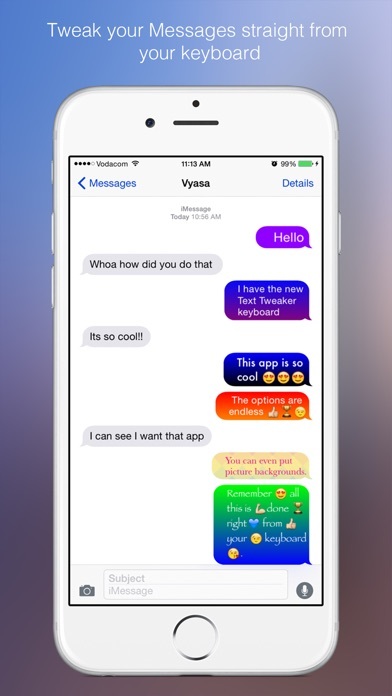 I dowloaded this app under the impression it'd let me customize my iMessges Bubble Colors. 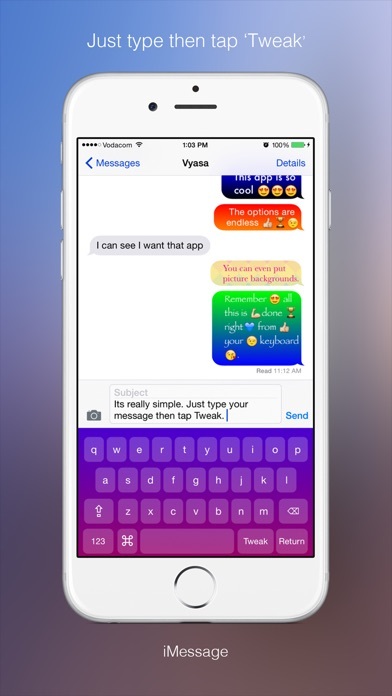 But, it required full access to my keyboard and didn't offer no way to change my bubble colors. TERRIBLE!! !😡🚫Words come out blurry and don't even send! Save ur money and don't get this or pro version!!!!!!!!!!! !